The following pie-chart shows the sources of funds to be collected by the National Highways Authority of India (NHAI) for its Phase II projects. Study the pie-chart and answers the question that follow. 11486 Yen is the amount of funds to be arranged through External Assistance. 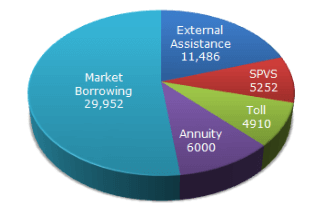 If NHAI could receive a total of 9695 Yen as External Assistance, by what percent (approximately) should it increase the Market Borrowing to arrange for the shortage of funds? Percentage increase required = (1791/29952)x100% = 5.98% ~= 6%. If the toll is to be collected through an outsourced agency by allowing a maximum 10% commission, how much amount should be permitted to be collected by the outsourced agency, so that the project is supported with 4910 Yen?